This year's EAA Convention flying event was planned similar to the Sun & Fun Adventure Rallies held in the last two years, this time in the setting of the magnificent Maluti mountain range, being in the format that EAA'ers enjoy, as a more relaxed fun kind of event mostly involving observation out of the window recognition of ground features and learning about the area being flown over. The kind of flying is not the high workload of precision timed navigation, but involves good crew cooperation in roles and responsibilities, and given the comments heard from the participants after the rally, it seems some cockpits had some hilarious moments, especially where there were a crew of three, a navigator with an additional observer. Looks like three pairs of eyes were worse than two. The format was in the form of a pre-defined 1:250 000 route map that was available prior to the event starting for everybody to either plan their route with traditional map plotting tools or to program their GPS's - if they were more at home following the magenta line. Each route's leg had turning point photographs to be recognised (either being correct or incorrect), most of them were Google Earth photos, then a few questions had to be answered on ground features or sites that were historic or scenic, mostly cryptic in nature. 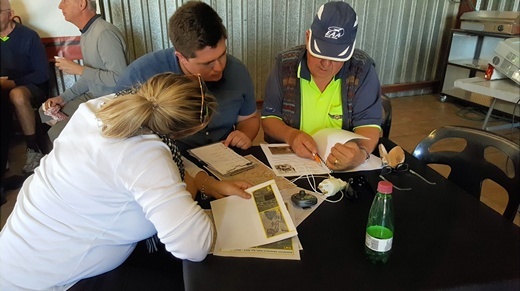 While the map was in everybody's hands, they all took the opportunity to look at the features at each of the turning points on Google Earth, not that it helped much it appears. The task booklet contained a section of wiki notes that would enable the crews to answer all the questions - with a warning - “Don't read at your peril….”, and guess what…., most forgot to find the answers in the most obvious place…. Some crews of course were googling for answers on their cell phones - because they can - somewhat inefficient given everything was right in front of them. The main theme of the route was to follow rivers and rails, the first part of the route being very scenic along the Ash River all the way to the outflow tunnel that has its source from the Lesotho Highlands Katse dam. 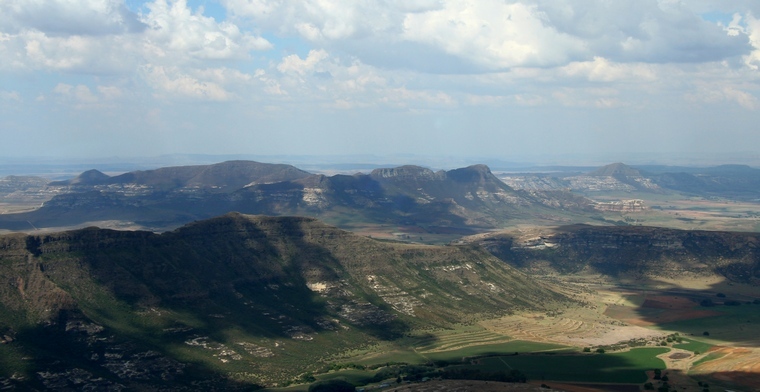 From there going east keeping the Golden Gate mountain range on the right past the town of Kestell into the renowned Boer War battlefield area of Groenkop. From there following the winding railway line back westwards towards the Big Cat Sanctuary of Lionsrock. This sanctuary, not obvious from the ground but very distinctive from the air have their animal enclosures shaped in the form of a Big Cat Paw. There were 11 crews who registered by briefing time, with a broad spectrum of aircraft participating, from the very fast GP4 with a nominated speed of 150 kts and Jabirus at around half that speed of 80kts. The weather was clear but had a stiff easterly wind probably 15kts or so, probably less than ideal conditions, but well flyable with at least the wind down the runway. 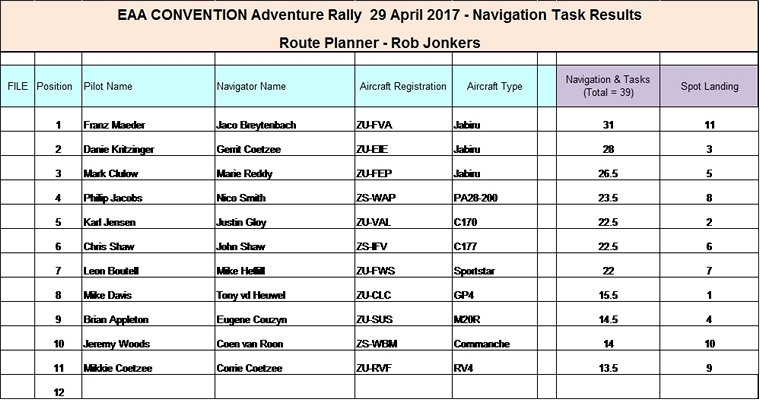 After the briefing, and with 20 minutes prior take-off - of handing out papers, the first competitors took to the skies at 13.15, with the last off at 14.05. A livetracking recording was also set up with some of the competitors, which although there was no real means to display this during the event, it was all recorded in the cloud with results shown below. From the three tracks that are shown, each one had some unique deviations, one would almost think they flew different courses. The red track went wrong right from the start and thought the start point was “east” of the field instead of “west”, although recovered nicely by finding turning point one. The blue track went off course after turn point 5 and followed the mountain range instead of heading towards Kestell, and later could not find the big Lion Sanctuary. 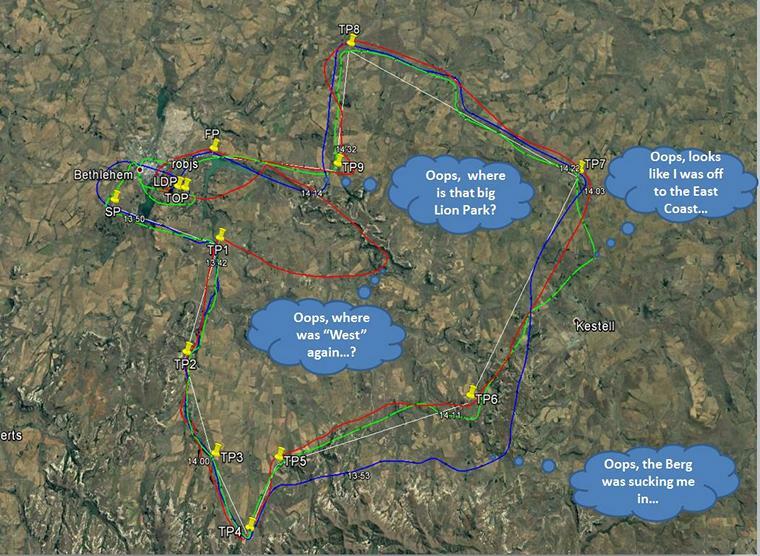 The green track appears to have done the best of the lot, and only temporarily lost the plot on leg 7. 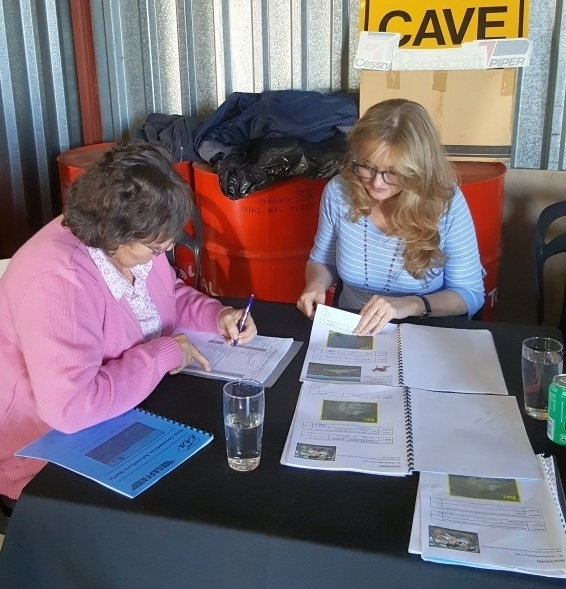 With everybody successfully home, it was time for marking the exam papers which was left to the strict invigilators of Rene Clulow and Joan Homan to record the points. Between the clues and photo recognition, a total of 39 points could be scored. With the prize giving only Sunday night, everybody had to wait in anticipation for a day before knowing what the results were, and when the evening dinner did take place, it was first revealed what interesting tracks the competitors flew to hilarious fits of laughter, before handing out the prizes. 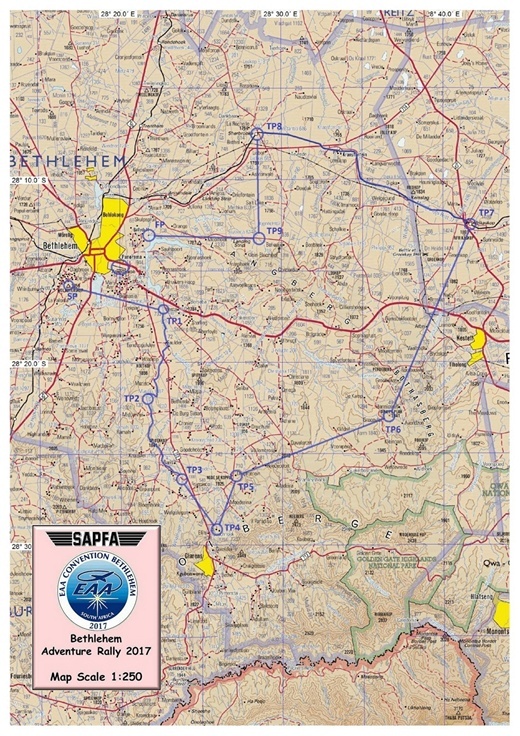 Within the first four places, were all local Bethlehem teams, appearing as if they knew the area better than most, or listened well at the briefing to read the wiki notes. 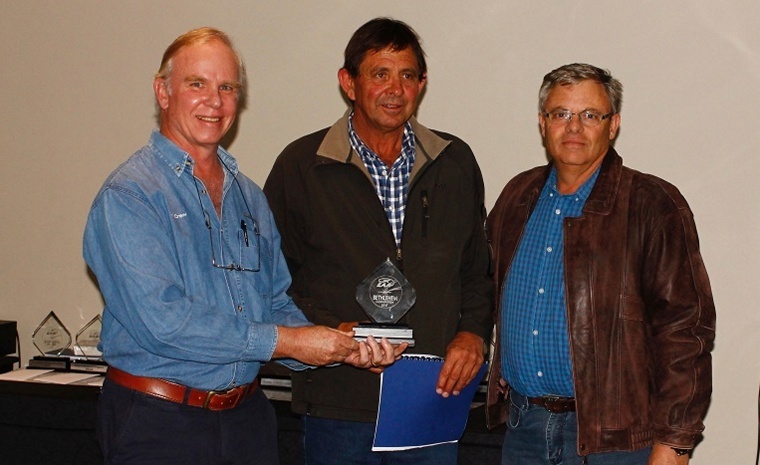 The winners were the local team of Franz Maeder and Jaco Breytenbach in a Jabiru, although they struggled to even spot land on the field, let alone the landing line. Thus came to the end of a hopefully enjoyable day for everybody who took part, and in the Spirit of recreational aviation, this kind of event is for sure a lot of fun.